Xtend is one of the leading intra workout supplements on the market. It is packed with ingredients that will help you get the most out of your training, boosting your performance, energy, maximisuing protein synthesis and enhancing your recovery so you can get back in to the gym faster. The beneficial effects of Scivation Xtend have even been proven in two independent university studies. Electrolytes – Sodium, potassium and chloride are vital electrolytes that are depleted through exercise. Not only are they necessary for optimal nerve and muscle function, but they assist rehydration by helping the body take in water. BCAAs – Xtend features a big 7g serving of these essential aminos in a scientifically backed ratio. BCAAs stimulate muscle synthesis and speed recovery. Glutamine – The most abundant free amino acid in muscle, replenishing glutamine after exercise is vital to prevent muscle catabolism, get rid of the metabolic waste products of exercise, and maintain optimal immune function. Citrulline malate – Scientific studies have shown citrulline is more effective than arginine at stimulating nitric oxide production, which is responsible for vasodilation. Increased blood flow allows easier transport of nutrients into muscle, waste products out, and importantly, it maximises your pump. Vitamin B6 – This vitamin is a vital cofactor in the reactions which help your body use energy and build muscle effectively. It comes in a variety of delicious fruit flavours, and contains no fat or carbs. Scivation also manufacture a product known as Xtend Endurance, which is designed for endurance athletes, and includes a carbohydrate blend with broad action designed to sustain over prolonged exercise. 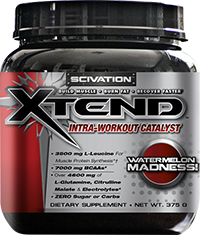 Xtend is designed to be used during a workout. Most people mix one scoop (13g) with 500mL of water and sip during their workout to boost performance and stay hydrated. Other people recommend one scoop of Xtend before a workout and another one after, to optimise the effects on recovery. Xtend can also be taken on non-training days to promote muscle synthesis and assist recovery. Because Xtend is free from stimulants, it is fine to take at any time of the day, before, during or after a workout, or at any time throughout the day on a non-workout day. Xtend is best absorbed on an empty stomach, so avoid taking your dose immediately before or after a meal.